Relax and unwind at this charming, laid-back getaway in the south of France! Get a taste of the simple life when you stay at this beautiful Uchaux getaway, which blends modern convenience with rustic sensibilities for a wholly unique vacation experience. This vacation rental is located in Uchaux, which is a small village tucked away in the rolling hills of Southern France. The city of Orange lies eight miles south, and Lyon is 120 miles to the north. In the living room, you ll find a comfortable sectional sofa (that converts into a double sofabed) as well as a cozy armchair. Sit down and put your feet up while you recover from the day s travels. Browse the local channels on the flatscreen TV, surf the internet thanks to the free WiFi, or just relax and admire the view from the living room windows. The well-appointed kitchen has everything you need to put together a tasty meal for your group, including a stove, a microwave, an oven, and a full-size refrigerator. Try your hand at cooking up a regional delicacy, or just snack on cheese and wine between leisurely meals at local restaurants. Sit down to eat at the kitchen table, which overlooks the back patio and offers views of distant hills. If the weather s nice, enjoy al fresco dining on the patio furniture. There s also a charcoal grill if anyone s in the mood for a barbecue. With room for up to four guests, this two-bedroom vacation rental is perfect for a small family, a few friends, or two traveling couples. Each bedroom features a double bed and large windows. There s also a private washer/dryer, so don't worry about unexpected spills derailing your vacation plans! Spend an afternoon touring one of the wineries and sampling some of the local vintages - maybe you ll find a few bottles to take home to your friends and loved ones. Take a day trip to the city of Orange and explore the UNESCO world heritage sites, including Théâtre Antique & Musée d’Orange and the Arc de Triomphe d’Orange. Or, head north to Bolléne and enjoy a scenic hike through the sandstone cliffs and hills that surround the town. Whether you re relaxing with a glass of wine or snapping photos of beautiful historic sites, you won t regret staying at this charming Uchaux vacation rental. Make your reservation today! 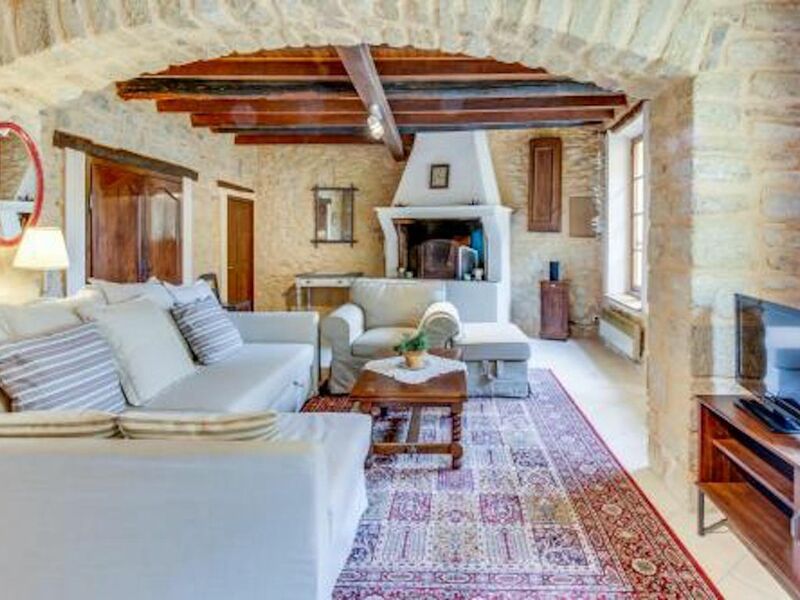 Set in the idyllic setting of the Provencal hamlet of Hauteville, Uchaux in Southern France, this very recently upgraded, expanded, and modernized Provencal medieval cottage is located along a narrow lane in the tiny village of Hauteville, Uchaux. It is a two minute walk from the Renaissance era Chateau de Masillan, part of which can be seen from the property. Travel times by car are three minutes to the village of Uchaux, and 20 minutes to Orange. From this comfortable, rural home base you can spend two weeks or more making easy day trips in literally every direction to see many scenic cultural, historical, and natural treasures. Pont du Gard floats near the top of any list of sites to see in Provence. It is the tallest of all Roman aqueducts, and contends favorably with the aqueduct of Seville, Spain for the title of grandest of all the surviving aqueducts. A UNESCO World Heritage Site, Pont du Gard was built in the first century AD as part of a project to supply water to the nearby city of Nimes. Avignon has to be on everyone’s list of places to go in Provence! A medieval city perched on a hill overlooking the River Rhone, the city is a UNESCO World Heritage site by virtue of its wall, papal palace (Palais des Papes), medieval bridge (Pont Saint-Benezet), and cathedral (Cathedrale Notre-Dame des Domes). For about a century during portions of the 14th and 15th Centuries, Avignon was the seat of the papacy. With the Roman Catholic Church being the only unifying institution in politically turbulent medieval Europe, in its brief, late medieval heyday Avignon served as the center of Western Christendom. There are a number of lovely hill towns within an easy drive of Hauteville. If you are short on days, Vaison may be the one or two hill towns you choose to visit. This is because it has all the charm of the loveliest of the Provencal hill towns, but it also has so much more history to offer! Its most immediately striking attribute is, of course, the upper town rising above the Ouveze river valley, with houses clustered along steep and narrow streets beneath the ruined castle built by the powerful Counts of Toulouse. You can visit the spartan medieval church, walk narrow, flower-decorated medieval streets, dine at one of the upper town restaurants, and climb to the summit to see the ruined castle and partake of the same encompassing view of the surrounding area that its defenders had 600 years ago. After a few days of caves, Roman ruins, and medieval castles, why not plunge south to spend a day beside turquoise waters at the rocky seashore of cliff-clad Cassis? Cassis is a Mediterranean jewel that is not given the praise it deserves in many guidebooks. It has natural scenery that surpasses anything on the classic French Riviera to the east, and rivals the best of the Greek and Italian isles and peninsulas. Ever heard the Irish song, The Orange and the Green? Although its name has nothing to do with the color, what was then the principality of Orange nevertheless contributed its name to the color-symbol of Protestantism. But most of Orange's history had occurred long before Martin Luther initiated the Protestant Reformation. For the village of Orange, history accelerated about 35 BC when Roman legionnaires who had fought in Spain and the Balkans were settled on the site of the Celtic village of Arausio in newly conquered Roman Gaul. Orange is a later corruption of Arausio -- the name of a local water god, with no association with the color or the fruit. The grandest tourist sites in Orange happen to be Roman, which together encompass a UNESCO World Heritage Site. You will warm up your Roman engines during the drive south from Hauteville past Cote du Rhone vineyards and fields of grain. A segment of Highway D11 becomes unusually straight for a significant part of the drive. Along this straightaway you are directly on the trace of the old Roman highway that connected points north to Arausio. As you pass down the Roman road, consider that hundreds of thousands of Gallo-Romans over several centuries traversed this same roadway en route to see performances in the very theater you are about to visit. As you move southward, you will first come to a splendid Triumphal Arch, which was erected on what was then the north edge of Roman Arausio. It was built in the Augustan period and has endured the passing of millennia in excellent condition. The arch's facades depict battles -- of which there were many -- between the Romans and Gallo-Germanic tribes. Julius Caesar's conquest of Gaul continued for several years, ending in 50 BC. But before the ascendancy of Caesar there were numerous battles with these tribes, several of which the Romans lost. In fact, a battle fought a few miles west of what was then Gallic Arausio in 105 BC resulted in one of the most disastrous defeats in all of Rome's history, with 80,000 Roman casualties! As the second century closed, these Gallo-Germanic tribes pressed their advantage and even crossed the Alps to threaten Rome itself. Julius Caesar had an argument that his conquest of Gaul was strategically defensive. The Theater of Orange is a must-see on a visit to the area.